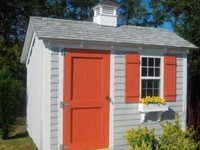 Spiders, dust, clutter, rusted metal and warped plastic come to mind when you think of a backyard shed. Most often sheds are hidden far off in a corner of the yard, or tall trees are planted to screen it from view. However, you'll want to put a Pine Harbor shed in a prime location. Once the fog rolls in, the temperatures drop and snow blankets the ground, does your kitchen table turn into a garden? 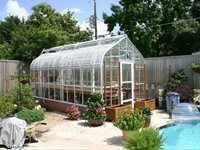 It sounds like you could use a greenhouse. 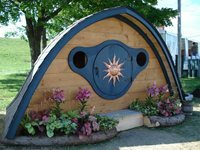 Whether you're a fan of Lord of the Rings movies or you prefer sitting down to read the original words of Tolkien, you've probably imagined what the inside of the tiny underground homes inhabited by Bilbo or Frodo are like. Well, here's your chance to find out. Whether you are looking to add office space, additional storage or a guest house to your backyard, a prefabricated shed may be the right option. 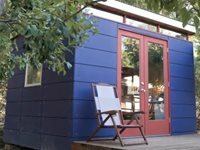 The three companies below offer unique garden shed kits that are incredibly stylish and more affordable than a house remodel or room addition.